Facial expressions caused by different facial muscles initially produce dynamic wrinkles, which are non-permanent lines and disappear when these muscles relax. Overtime repeated use of these muscles cause permanent or static lines which can remain even when the muscle is relaxed. Here at Vamp Cosmetic Clinic, small amounts of anti-wrinkle solutions are injected with tiny needles precisely into certain muscles of the face to relax these muscles in order to eliminate or soften facial lines. This is an affordable minimally invasive treatment to provide a more youthful and fresh look. This is a non-permanent treatment, the effects generally last from 3-4 months, but can last as long as 6 months. 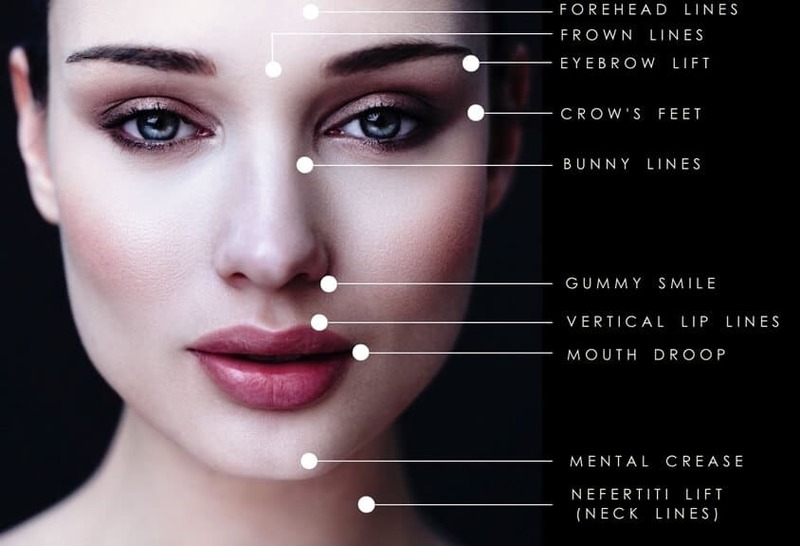 A combination of these areas can be treated with anti-wrinkle injections for more complete facial rejuvenation. Also known as number 11 lines which are the vertical lines between the eyebrows. Lines around the outer corner of the eyes. Lines across the bridge of the nose caused by crinkling the sides of the nose. Horizontal lines on the chin. Showing too much of the upper gum when smiling. Commonly referred to as smoker’s lines. Anti-wrinkle injections are also used to give an eyebrow lift which can help with eyelid hooding. We can also use anti-wrinkle injections to lift the corners of the mouth which happens as we age. A Nefertiti Lift is the treatment of the platsyma muscles in the neck with anti-wrinkle injections to treat sagging jowls and neck bands. This treatment will also reduce the reappearance of sagging jowls with advancing age.